Bandai Hobby SD EX-Standard RX-0 Unicorn Gundam Destroy Mode Model Kit. This kit is easy to build not requiring paint, glue or even tools to remove the plastic. Manufacturer # BAN204433. This kit is easy to build not requiring paint, glue or even tools to remove the plastic. Parts can be added to High grades for much more customization. Manufacturer # BAN204935. BB / SD 385 LEGEND BB KNIGHT UNICORN GUNDAM SENSHI PLASTIC MODEL KIT BANDAI NIB. Zeromaru's enhanced weapon form, which bears a resemblance to the Full Armor Unicorn, appears! Includes 3 shields, bazooka parts, 2 kunai, katana, rifle, effects, and 2 hand parts. Can also transform into "Real Mode" which resembles a normal proportioned Gundam. Key Features. Plastic pieces moulded in color. Hobby knife. Upgraded form of the Winning Gundam from the Gundam Build Fighters Try TV series. Gimmicks include part interaction other HG Build Fighters kits! Runner x8, Foil Sticker, Instruction Manual. Bandai Hobby Gundam Build Fighters Try Star Winning Gundam SD Model Kit. Trending at $14.35eBay determines this price through a machine learned model of the product's sale prices within the last 90 days. Injected in its Gundam colors snap together with no glue need or paint. No longer manufactured overseas only in special preorder and high in demand by Gundam fans. Plus it can be transform into first Unicorn version. Bandai Hobby SEED Destiny SD EX-Standard 006 Strike Freedom Gundam Model Kit. Bandai's SD Gundam EX Standard lineup features stylish proportions and newly designed joints for improved posability, as well as parts and weaponry that can be swapped with HG kits! SD GUNDAM EX STANDARD AILE STRIKE GUNDAM built and painted. Condition is Used. Shipped with USPS First Class Package. Bandai Hobby SD Gundam #2 Crossbone Gundam X1 "Crossbone Gundam"
Runner x1. Instruction manual x1. Note: Great for Gundam Collectors and fans. Bandai's SD Gundam EX Standard lineup features stylish proportions and newly designed joints for improved posability. This is a posable, high-grade or better injection-plastic kit of an item from the Gundam universe. SD Gundam Cross Silhouette SDCS #08 Freedom Gundam Model Kit. • Box condition is sold as is. However, if you want the extra service, we will provide it. • We will hand select the best box condition out of our inventories. Gundam Build Fighters Try SDBF #032 SxDxG Gundam Model Kit. The SDG-R3 Giracanon Gundam is one of three Gunplas in team SD-R. However, if you want the extra service, we will provide it. • We will hand select the best box condition out of our inventories. Key Features. Plastic pieces moulded in color. DUE TO SMALL PARTS THAT MAY BE SWALLOWED KEEP AWAY FROM CHILDREN AGE 3 AND YOUNGER. Hobby knife. SD GUNDAM CROSS SILHOUETTE ZETA GUNDAM. 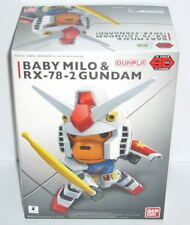 A new generation of SD Gundam kits is here! This is a posable, high-grade or better injection-plastic kit of an item from the Gundam universe. Series:SD Gundam. SD Shining Gundam GF13-017NJ model kit by Bandai. Model pieces are unopened. Romance of the three kingdoms. What you see is what you get! Buy 2 or more and save 5% off each item! Snap together does not require glue. No longer manufactured overseas. Condition: New and unbuilt, sealed in its original plastic. Injected in its Gundam colors snap together with no glue need or paint. No longer manufactured overseas only in special preorder and high in demand by Gundam fans. Kits are molded in color and feature easy snap-assembly. Depends on the kit, many also have little spring-loaded missile shooters that launch plastic projectiles (hands, bombs, etc.). Stickers included, too. Scale: N/A. Key Features. Plastic pieces moulded in color. Hobby knife. Go to ourMultiple Item Orders page for step by step instructions. SD BB 386 Gundam. RX-105 Xi Gundam. Plastic Model Kit. Assembly is required. This is a very simple kit, so it will be easy to assemble and will look super cute. Even the box is still in great condition. I was collecting and building Gundam models many years ago, and I still have quite a few that I just never started building. Senshi Senshi. New Sealed. Still sealed in the original shrink wrap. 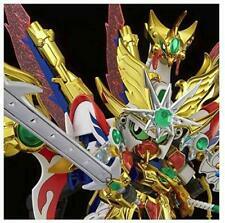 SD Gundam LEGENDBB. Knight Superior Dragon. Assembly is required. Unicorn Gundam 03 Phenex Gundam NT Bandai SDGCS. The tail feather parts have two points of articulation as well. Clear parts have been used in the body to recreate the best color division ever seen in a SD unicorn Gundam. Age: 8 years and older. Japan Usage Item. Electronics. Li-ion Battery. We do our best for you!! Bandai Hobby SD Gundam #1 RX-78-2 Gundam "Mobile Suit Gundam"
BANDAI (BANDAI) Gundam Base Limited. Asia, Middle East. Even if you think to yourself, "But the item I want is only available in Japan.". We will look for and suggest the best products on your behalf. These are all Gundam model kits that I bought myself with the intention of building them. SD Gundam BB RX-0 Unicorn Model Kit Movie Limited Green Frame Pearl Clear Ver. RX-0 Unicorn Gundam. Glue and paint are not required for this model kit. Safety Warning: This Product is for Adult Collectors. This is a new unopened model kit and requires assembly. The Gundam 00 Diver Ace includes 2 GN Sword IIs and a Diver Ace Unit set. The main character's Gunpla from Gundam Build Divers joins Bandai's SD Cross Silhouette series! However, if you want the extra service, we will provide it. This is the SD BB#17 Musha Gundam Plastic Model Kit made by Bandai. Key Features. Plastic pieces moulded in color. Hobby knife. Bandai Hobby SD Gundam #3 Nightingale "Char's Counterattack"
The SD Gundam franchise is a science fiction franchise in Japanese pop culture, with multiple storylines spanning manga, anime, games, and toys. SD or “Super Deformed” Gundam expands the franchise with anthropomorphized and “chibi” versions of the Gundam characters and robots that are suitable for children. If you wish to add to your child's recreational hobby, there are a number of items from which to choose. What is the SD Gundam franchise? SD Gundam takes the original “mobile suits” and turns them into anthropomorphized versions. After initially being offered to children, the SD universe was expanded to include characters and robots specific to SD rather than solely reinventing original Gundam characters. The SD Gundam universe now spans manga, anime, toys, models, video games, and RPGs. What are some of the SD Gundam storylines? Here is an overview of the various SD Gundam storylines. Mobile Suit SD Gundam: The original anime that used characters and mecha from previous Gundam storylines. Command Gundam: These mecha are military models that are split into land, sea, and air varieties. Their singular planet is based on the United States. Knight Gundam: These mecha are reimagined as knights, sorcerers, and other beings from European fantasy. Musha Gundam: This storyline has mecha that is reimagined as ninjas, samurais, and other figures from feudal Japan. This is the longest-running series. What are some features of SD Gundam model kits? SD kits are customizable, allowing for parts swapping between models to create variations and hybrids of the characters. They do not necessarily adhere to realistic depictions, which allows users to exercise their imagination. These modified mechas are often used by children who go on to share images of their customizations and swap tips and ideas. Bandai, the company that makes the kits, offers a monthly contest for the most notable customization. The SDX and SD Ex-Standard continue the customization possibilities, but with action figures. With decades' worth of storylines and related merchandise, the SD Gundam franchise has a worldwide fanbase. Most items are collectible, and fans often trade ideas for customizing their models, video game tips and codes, and fan fiction stories related to the various storylines. SD Gundam merchandise not only allows buyers to play with their Gundam character, it also provides a means to connect with other fans in the community. Content provided for informational purposes only. eBay is not affiliated with or endorsed by SD Gundam.